M/Y Olympia (ex Twin Palms I) is a 2008 22m (75') motor yacht which is based in Thailand, South East Asia as built by Tachou Shipyard with interior design by Martin Palleros. 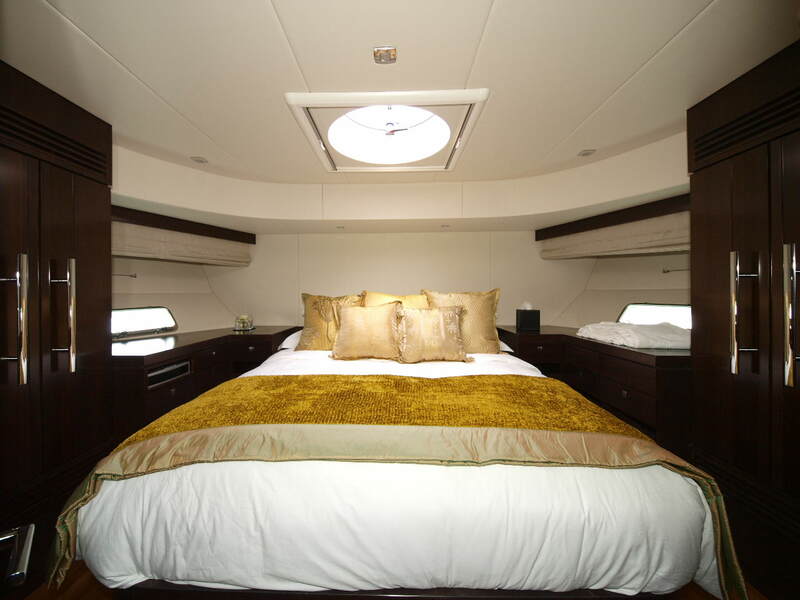 Motor yacht Olympia is able to accommodate up to 8 guest sleeping (in 4 cabins) and up to 20 charter guests cruising. 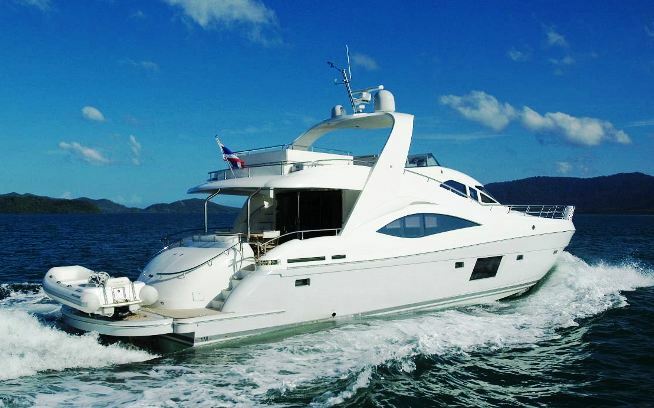 She makes a great yacht for a Thailand yacht charter vacation. Yacht Olympia (ex Twin Palms I) is a 23 meter fly-bridge motor yacht with modern lines that really are exciting and stylish. She has fresh, modern interiors that are teak, stained walnut, light beige leather, all simply oozing elegance and attention to details. One of the great things about charter yacht Olympia is she has a couple of efficient 811ct Caterpillar engines and the finest in navigation equipment with Raymarine. A luxury Williams 385 turbojet tender allows beaching and shallow water access in full safety as well as enabling up to 6 guests to reach the most exotic and remote private beaches. Quick afternoons water-ski or wakeboard will also be available using this powerful turbo jet tender. Her deck saloon, which is separated by a glass door from the alfresco lounge in the aft, has interesting bulkhead stairs so that the visuals are uninterrupted from stern to stem. Olympia's sofa and its Sony flat 46” screen pop-up LCD TV area sit separate from the eight-seated dining table which is up a step too. 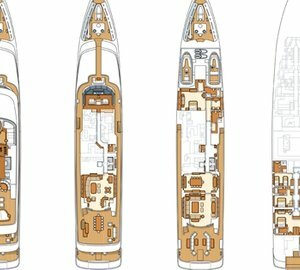 Both side, above the main deck, a passage leads from there to the fly-bridge which has attractive non-scratch anthracite grey trim and a U-shape sofa with pop-out table for guests who want to watch the navigation process. 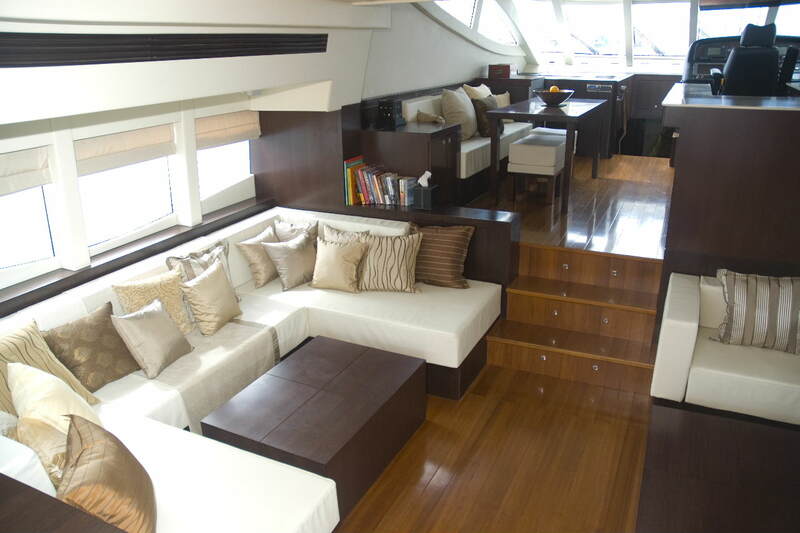 To port of the saloon is the steel and teak galley with its watertight outside port. Superb catering, from the freshest Andaman Sea seafood to perfectly roasted carvings and mature cheeses, all accompanied by fine wines and champagnes can be provided by Twinpalms Phuket renowned Chefs and waiting team. Moving below decks, we first meet the owner’s stateroom amidships. It boasts a king-size bed, vanity table & desk as well as separate bathrooms. It also has big opening side windows. There’s even a lounge alongside the port side for even better sea views. A sliding door leads you into the bathroom which has an efficient shower and also day light. 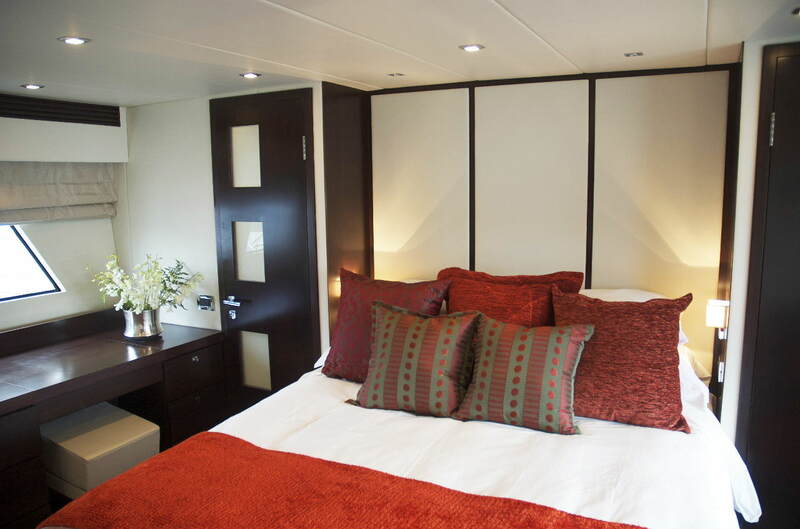 “This is typical of the spaciousness of Martin Palleros both in terms of its internal layout and the visual relationship between inside and outside.” There are also three en suite guest stateroom, one traditional VIP forward cabin, one twin bedded cabin and one bunk bedded cabin. The flying bridge on Motor yacht Olympia (ex Twin Palms I) is home to the second pilot station but also boasts two ample sun pads and BBQ area for snacks and meals complete with an huge U-shaped sofa and a large table both shaded by a canopy that stretches out on the bimini frame from the roll bar. 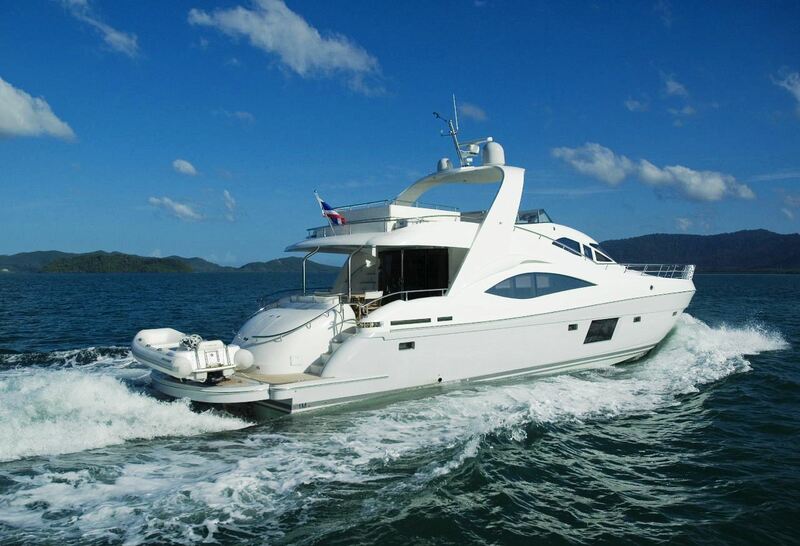 Motor yacht Olympia boasts sophisticated combined Bose and Sony entertainment systems throughout.